This is not the chamber pot of William Shakespeare. It isn't The Bard's own thunder mug. 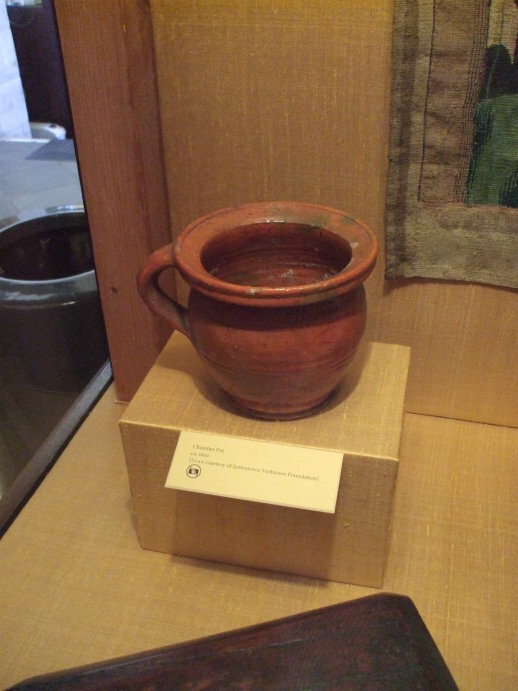 However, this is an English chamber pot from approximately 1600, during Shakespeare's life, and it is very much like what he used. The Folger Shakespeare Library in Washington D.C. had a special exhibit on day-to-day life in Shakespeare's time. They didn't have an English chamber pot from England, as chamber pots weren't the sort of family treasure that you carefully kept. This one was found in an archaeological excavation, it was brought from England to the English colony at Jamestown, Virginia. Jamestown was the first permanent English settlement in the Americas. Jamestown was somewhat of a ongoing disaster, although it was less disastrous than some colonies that preceded it like the Lost Colony of Roanoke. Shakespeare lived 1564–1616. It seems that several of his plays were on the London stage by 1592. The First Folio, containing all but two of his plays, was published in 1623. Jamestown was established in 1607 by the Virginia Company of London, briefly abandoned in 1610, and then went on to serve as the capital of the colony of Virginia for 83 years, from 1616 until 1699, at which point it was rapidly abandoned and it decayed. The location was chosen for being a defensible point on water navigable by the ships of the era. It was uninhabited by the local natives because they knew better. Jamestown was located in what was called Tsenacommacah and spelled in widely varying ways in Roman characters — Tsenacomoco, Tscenocomoco, Tenakomakah, Attanoughkomouck, and Attan-Akamik were all used. The name meant "densely inhabited land" in the language of the Powhatan Confederacy. It refered to an area of land about 100 miles on a side. Its southern boundary was the south bank of the Powhatan River (which the English called the "James River" after their King James I), and the northern boundary was the mouth of the Potomac River (for which the English kept the original Algonquian name). It extended from the Atlantic coastline inland to about the fall line of the rivers. The confederacy was based near the present-day city of Richmond, and it was led by Wahunsenacawh, popularly known as Chief Powhatan. The Paspahegh tribe were members of the confederacy, living the closest to the English settlement. Jamestown was swampy, largely isolated from the surrounding land, plagued by mosquitos, and had only brackish tidal river water that was not suitable for drinking. The colonists compounded their poor choice by arriving too late in the year to establish any crops, not that any would have grown well there had they arrived earlier. And who was to do the agriculture anyway, with a large fraction of their party ranking gentlemen and their manservants, all unaccustomed to the hard labor of building a colony and establishing farming. Anyway, arrive they did, with English lavatorial hardware like this chamber pot. This would be just the thing to keep in your bedroom, sitting on the floor right next to or below your bed. Then you could save, well, whatever, overnight in the pot. And then fling the contents out the window in the morning. Europeans were amazed when they first came to Central and South America and found huge cities without open sewage running down all the streets. Back home in Europe, the streets were basically open sewers. Pedestrians were regularly hit by chamber pot contents being thrown out of overhead windows. The Romans had sophisticated water supply systems and decent sanitation systems to remove sewage and other waste. But with the long decline and disappearance of Roman culture, sanitation in Europe went from primitive to largely non-existent. Meanwhile the Classic Mayan civilization had sophisticated underground aquaducts and flush toilets at Palenque. They even carved the local limestone into porous cylinders to produce household water filters similar to modern ceramic water filters. Henry Doulton invented a ceramic water filter in 1827, the Mayans had then during the Classic period of approximately 800-1200 AD. The Powhatan Confederacy initially welcomed and helped the fairly inept English settlers with gifts of food and assistance raising and gathering their own. But relations quickly turned bad, and warfare and disease had annihilated the Paspahegh tribe within three years. The almost complete lack of sanitation at Jamestown must have played a role in this. Then starvation and disease began killing off the English, with over 80% of them dying during the "Starving Time" of 1609-1610. Meanwhile the Virginia Company had brought eight Polish, Slovak, and German settlers to the colony in 1608. A few of them built a small glass factory, but all the Germans and a few of the rest decided their chances were better with the natives and defected with weapons and supplies. In 1619 the English had captured a Portuguese slave ship in the West Indies, and brought all 50 of the men, women, and children — the first documented African slaves in the English-controlled mainland. The Folger Shakespeare Library in Washington D.C. has the world's largest collection of the printed works of William Shakespeare and a significant collection of other material from the Early Modern period of 1500-1750. 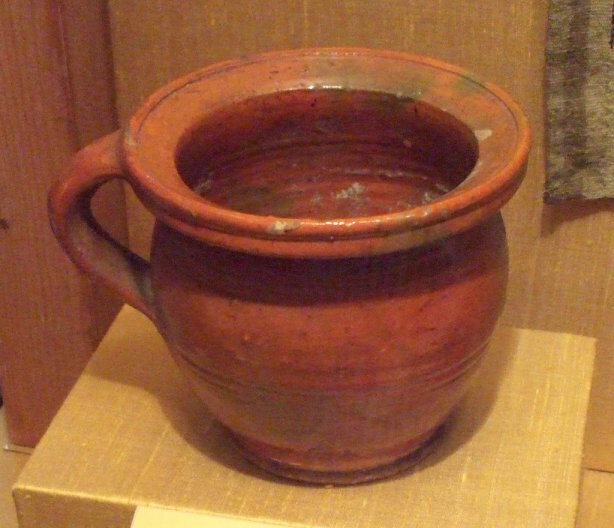 This chamber pot was in a special exhibit at the Folger Library in Washington DC, just behind the Library of Congress and within a block of the U.S. Capitol and the Supreme Court. The Folger is dedicated to Shakespeare, his works, and the world he inhabited. Chamber pots and all. Here you see a somewhat unusual picture of the Folger on a snowy day. The sanitary ware of the period appears at least once in Shakespeare's work. In Henry IV, Part 2, Act 1, Scene 2, Falstaff has had a physician examine his urine. FALSTAFF: Sirrah, you giant, what says the doctor of my water? PAGE: He said, sir, the water itself was a good healthy water, but, for the party that owed it, he might have more diseases than he knew for. 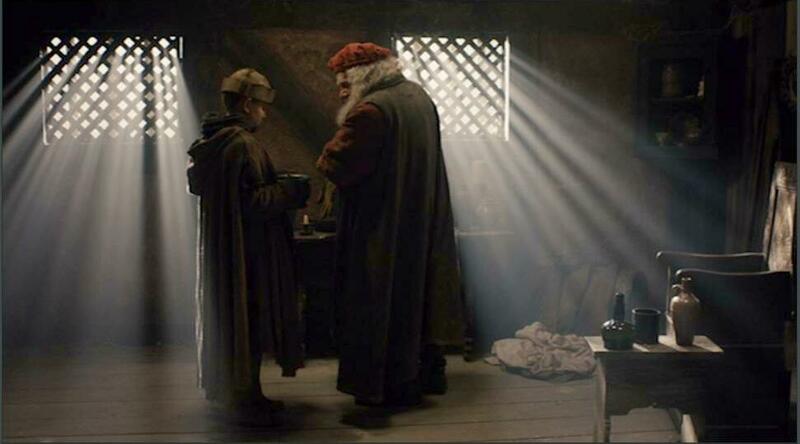 Falstaff and his page with Falstaff's chamberpot and urine, from The Hollow Crown. The makers of the miniseries had the page bring the urine back. While the Library of Congress is adjacent on two sides, the Folger is a privately founded independent research library now administered by Amherst College. About 750 copies of Shakespeare's First Folio were printed in 1623. It contains 36 of his 38 plays, all but Pericles, Prince of Tyre and The Two Noble Kinsmen, and is the only reliable text for about twenty of them. 228 copies of the First Folio are known to still exist. The Folger holds 82 examples of the First Folio, far more than any other collection. The second and third largest collections are at Meisei University in Tokyo (12) and the British Library (5). The original price was £1, equivalent to about £95-£110 today. The few original folios would bring a few million to maybe fifteen million pounds today. The prices on modern editions look pretty attractive.